Minister of Communications, Climate Action and Environment, Richard Bruton, announces the Government’s commitment to increasing the amount of electricity generated from renewable sources from 30% to 70% by 2030. Whilst speaking at the Fine Gael National Conference in Wexford this past weekend, Bruton noted to reporters that the commitment will require “significant changes” and the introduction of new legislation. He went on to say “We will have to strengthen our network”. And “Of course, this will mean that we will have to look beyond wind energy on land and we will have to prepare now for an important offshore wind capacity in our system” . Bruton said the government will have to introduce new legislation to deal with the movement. Burton was asked by reporters if households would see an increase in electricity bills as a result of the move. 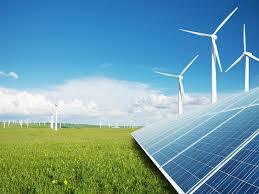 The Minister said: “We are not going to deliver renewable energy sources at zero cost“. Ireland are currently ranked 48th out of the 56 countries in the Climate Change Performance Index. With a score of 40.84. The EU average is 60.65. Do you think Ireland will meet the Government’s commitment to generate 70% of its electricity from renewable sources by 2030?